In April of 1942, in the early days of World War II, 60-80,000 Americans and Filipinos were captured by the assaulting Japanese forces after the Battle of Bataan. These prisoners of war were then forced on a 65 mile death march north to various camps. Wounded, malaria ridden and lacking essential survival supplies many did not survive the journey. Many others were summarily executed by their captors for minor offenses. The ones that survived the trek spent the remainder of the war struggling in some of the most austere prisoner of war conditions the US has ever seen. For the last 30 years in the high desert of White Sands Missile Range in New Mexico a crowd has gathered to pay homage to this group of heroes. 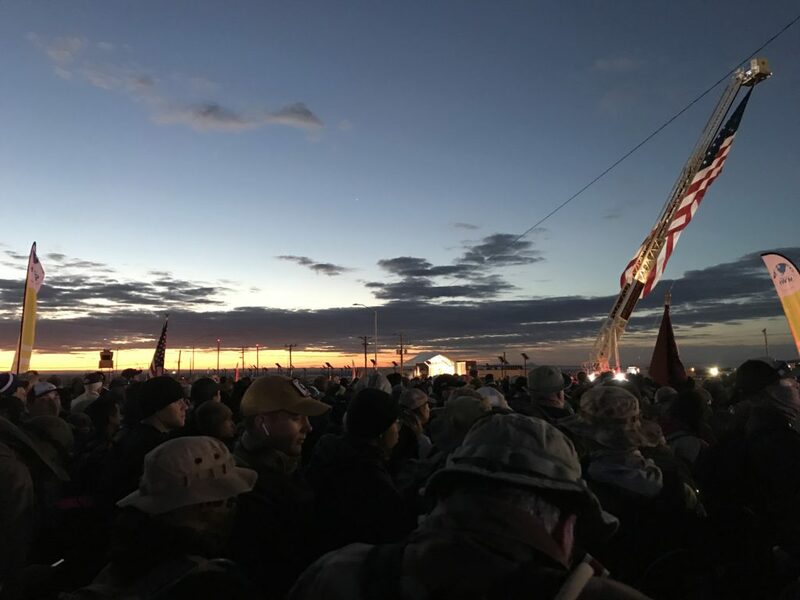 Military, veterans and proud Americans come together for a 26.2 mile commemorative trek, the Bataan Memorial Death March. Marchers have the option of registering for either a light or heavy category. The distinction being that the heavy category would have a weighted pack of no less than 35 lbs. This was our first year taking part in the event. Drew Huebsch (R&D Director), Brock Williams (Sales Director), Blake Heinrich (Military Sales Account Manager), Zac Gilliland (Associate Brand Manager) and Caleb Dougherty (Order Processing Supervisor) made up our team in the Civilian Light Division. 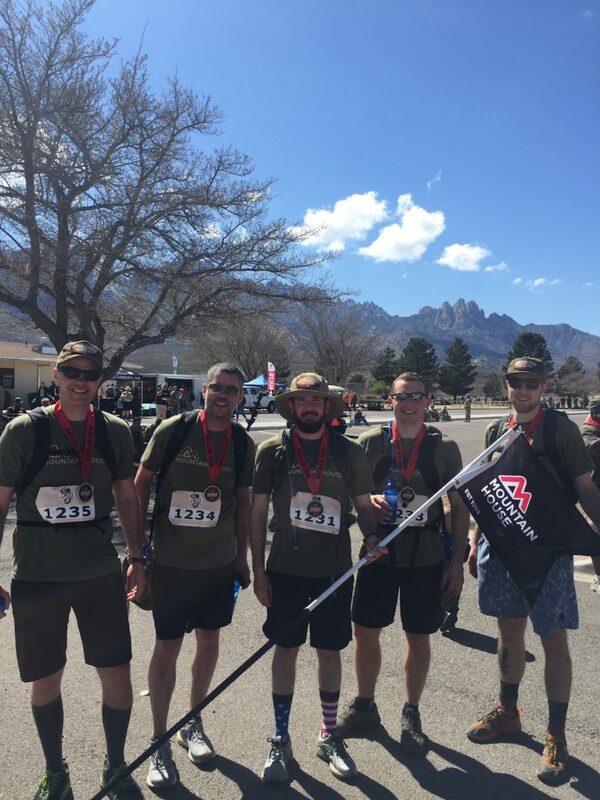 On Friday and Saturday, March 15th and 16th, our team spent time handing out samples of Mountain House and meeting other marchers as they filtered through the Las Cruces Convention Center to pick up their registration packets and talk to race sponsors. We met people that had packed Mountain House for decades and were excited to see us. We also met some who weren’t familiar with Mountain House by name but, knew us by the MRE components we offer and how tasty they are compared to some of the competing products. Come Sunday, with a 4am departure time, our team was shivering at the starting line with the other 8,626 marchers and runners that registered for the event. After a brief opening ceremony that included honors rendered to the 5 survivors of the Battle of Bataan in attendance, and ended with the resounding BOOM of a cannon, our marchers were off. With a high of only 64 degrees, following a day of light rain and some snow in the higher elevations we couldn’t have hoped for better conditions. The wounded warrior group started with the first cannon blast, followed shortly by the marathoners (folks that were actually running the course). We started with the rest of the civilian light group in the third heat. The course started on pavement, quickly transitioning to low rolling hills of sand and gravel until mile 7-8. Within the first few miles we saw a familiar black and orange flag. We stopped to take a quick group photo with some Cadets from Oregon State University’s Army ROTC. Alternating between jogging and hiking, we hit pavement again between mile 7 and 8 before proceeding up a steady incline of almost 1300 feet. The first marathoners started to pass us coming back the other way, nearing their 20 mile mark. The back half of the course was a series of uphill/downhill segments. It seemed like these would never end! Army Blackhawk helicopters flew over the course, motivating us almost as much as the Mountain House flag we were carrying. We hiked the uphills and jogged the down hills before progressing into an area known as the “sand pit”. This featured several miles of loose, deep sand. Our way was made a little easier due to the rain that came on Saturday, allowing some areas to pack down a bit, but it was still slow going. We came across marchers who’d been ahead of us from the start. One marcher was just 10 years old! Making the trek all on his own. Another was intimately familiar with our brand and products, Tim, a former Mountain House Ambassador from years ago. “Is Jim Merryman still there?”, he queried. We assured him that Jim was still at the helm, and he suggested we invite him to join us if we did the march again next year. As we neared the finish line we felt a renewed sense of energy, some of the aches may have even faded a little. We broke into a run for the last quarter mile or so. With the finish line in site we rounded the last corner. A fellow marcher took a fall as we approached him, and we helped him up. Knees bloodied, he insisted on finishing on his own, embodying the fighting spirit of everyone we’d met that day. We came in with a team time of 7 hours and 31 minutes, averaging just under 3.5 miles an hour. It wasn’t until scores were posted later that night that we found out we took 3rd of 18 teams in our division! One of the greatest takeaways I had from the trip was the chance for interdepartmental team building. Spending time with a group of Mountain House employees that I don’t work with every day was really enlightening. A close second was talking to consumers about our brands, hearing their favorite flavors and the unique ways they use our products. 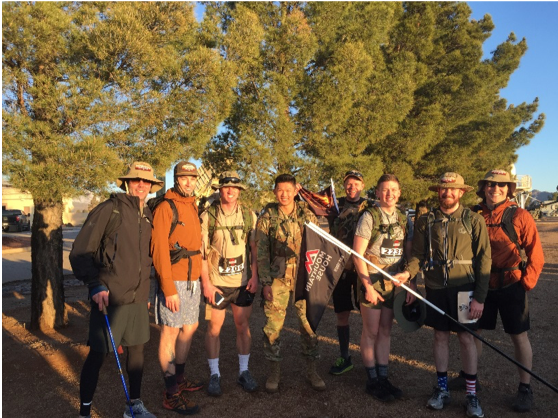 We came to the Bataan Memorial Death March in homage to those who sacrificed their own lives and freedom, with a spirit of team camaraderie, a desire to tap into our own strength, and to connect with an engaged and passionate community. Mission accomplished. 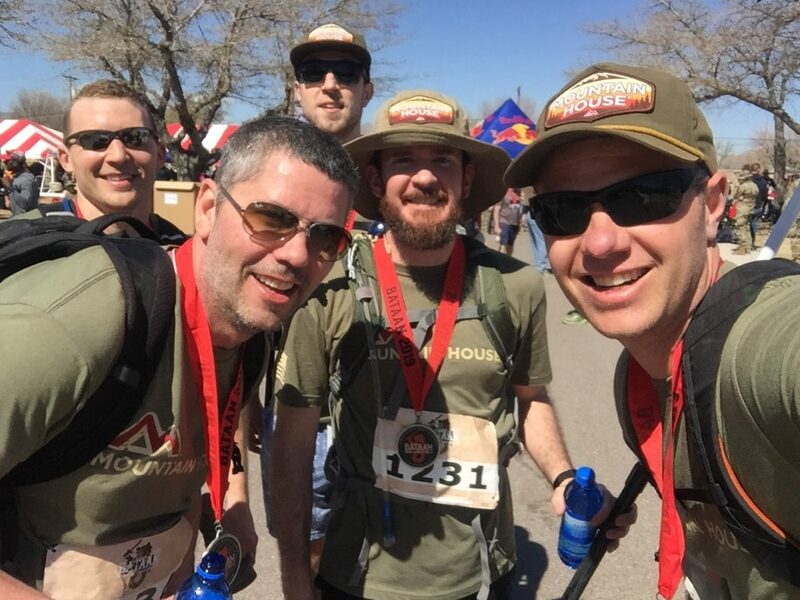 This entry was posted in General and tagged bataan death march, employees, military, OFD Foods by Mountain House. Bookmark the permalink.